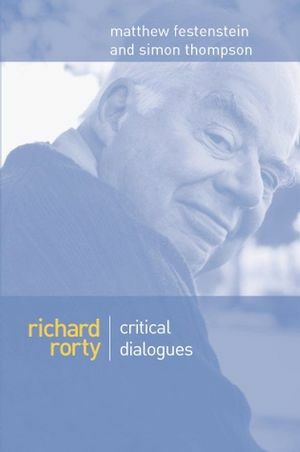 Richard Rorty is one of the most influential and provocative figures in contemporary intellectual life. He argues that many of philosophy's traditional concerns are redundant, and that the goal of inquiry should not be truth but human betterment. In this collection a distinguished team of scholars grapples with the implications of his writings for social and political thought. Avoiding mindless adulation or ritual denunciation, they offer careful but critical investigations of the meaning of Rorty's work for a range of important issues. Topics explored include anti-foundationalism; irony and commitment; justice; liberalism and utopianism; reason and aesthetics; humanism and anti-humanism; the Holocaust; the theory of international relations; social democracy and the pragmatist tradition. Each essay is followed by a reply written for this volume by Rorty. The volume also includes a substantial essay by Rorty on 'Justice as a Larger Loyalty'. This volume is indispensable for any reader interested in Rorty's work, or in contemporary debates in social, political or ethical theory. Contributors: Molly Cochran; Daniel Conway; Matthew Festenstein; Norman Geras; John Horton; David Owen; Richard Rorty; Kate Soper; Simon Thompson. 1. Richard Rorty: Pragmatism, Irony and Liberalism: Matthew Festenstein. 2. Irony and Commitment: An Irreconcilable Dualism of Modernity: John Horton. Reply to John Horton: Richard Rorty. 3.Richard Rorty on Truth, Justification, and Justice: Simon Thompson. Reply to Simon Thompson: Richard Rorty. 4. Irony, State and Utopia: Daniel Conway. Reply to Daniel Conway: Richard Rorty. 5. The Avoidance of Cruelty: Richard Rorty on Liberalism, Scepticism and Ironism: David Owen. Reply to David Owen: Richard Rorty. 6. Richard Rorty: Humanist and/or Anti-Humanist? Kate Soper. Reply to Kate Soper: Richard Rorty. 7.Reason and Aesthetics Between Modernity and Postmodernity: Habermas and Rorty: Richard Shusterman. Reply to Richard Shusterman: Richard Rorty. 8. Progress Without Foundations? Norman Geras. Reply to Norman Geras: Richard Rorty. 9. Rorty's Neo-Pragmatism: Some Implications for International Relations Theory: Molly Cochran. Reply to Molly Cochran: Richard Rorty. 10. Pragmatism, Social Democracy, and Political Argument: Matthew Festenstein. Reply to Matthew Festenstein: Richard Rorty. 11. Justice as a Larger Loyalty: Richard Rorty.